Not only Americans, but the entire world is concerned about the prospect of Trump becoming successful. On this note, let me identify which Nepali politicians share similarities with Trump, as every country has some political leaders like him and Nepal is not an exception. Several Nepali politicians come to my mind. First comes the Maoist leader (and current PM) Prachanda, whose populist slogan to turn Nepal into Switzerland is similar to Trump’s slogan to “make America great again!” The way Trump doubts and accuses other leaders, I will not be surprised if he gets inspired by Prachanda to reject the election result. Another politician is KP Oli who incited nationalistic feelings at public forums without being sensitive towards a certain section of the country’s population. Moreover, Oli and Trump both try to come up with whimsical quotes to be popular. The third one is Kamal Thapa, who is as opportunistic and directionless as Trump. Although Thapa raised a strong voice in favour of monarchy during the second Constituent Assembly election, he did not hesitate to argue later that he is more focused on reestablishing Nepal as an official Hindu state. His anti-secularism plank helped him to come back into mainstream politics. 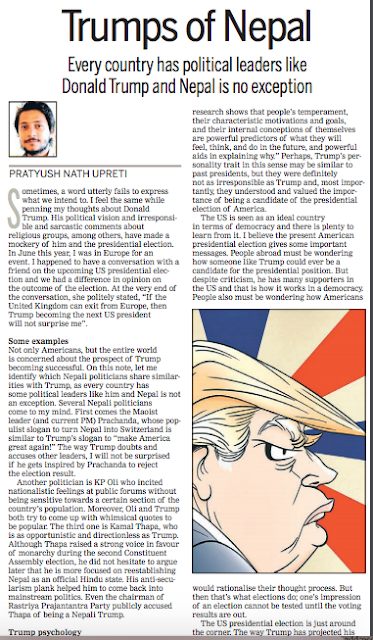 Even the chairman of Rastriya Prajantantra Party publicly accused Thapa of being a Nepali Trump. At the time when the world is portraying Trump as a cartoon character, a few like me are amused and wondering if there was no better candidate in the Republican Party. Perhaps candidature is influenced by many factors, and not merely by the intellectual capacity and personality of the leader. Recently, The Atlantic, an American magazine, ran a story titled The Mind of Donald Trump, in which interesting observations have been made on his personality. The article states that he possesses characteristics such as narcissism, disagreeableness and grandiosity, among others. Further, the article mentions that “a large and rapidly growing body of research shows that people’s temperament, their characteristic motivations and goals, and their internal conceptions of themselves are powerful predictors of what they will feel, think, and do in the future, and powerful aids in explaining why.” Perhaps, Trump’s personality trait in this sense may be similar to past presidents, but they were definitely not as irresponsible as Trump and, most importantly, they understood and valued the importance of being a candidate of the presidential election of America. The US is seen as an ideal country in terms of democracy and there is plenty to learn from it. I believe the present American presidential election gives some important messages. People abroad must be wondering how someone like Trump could ever be a candidate for the presidential position. But despite criticism, he has many supporters in the US and that is how it works in a democracy. People also must be wondering how Americans would rationalise their thought process. But then that’s what elections do; one’s impression of an election cannot be tested until the voting results are out. The US presidential election is just around the corner. The way Trump has projected his image as an anti-immigrant candidate can lead the American society to disintegrate and send a very negative message to the global community. Let’s hope that sense will prevail among a majority of Americans and that they will use their wisdom in the upcoming election. Coming back to Nepal, besides the three leaders mentioned earlier, there are several other political figures who can be considered as Nepali Trump. As a result, the people of Nepal have had to suffer a lot and they are still hoping to get a genuine leader.